Certain widely accepted postulates are now making way to new paradigms based on oral health promotion and changing patient behaviour before any clinical intervention. Advances in the scientific understanding of disease progression have also allowed a shift in focus from a restorative/mechanistic approach to a more comprehensive perspective, where patient education and behaviour changes precede any restorative work. Once the patient is committed to being a part of his own treatment by having a clear understanding of the reasons why the restoration is needed, we can then perform restorative dentistry with more confidence in a successful long-term prognosis. 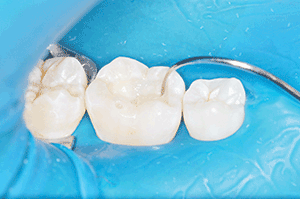 Potential pressures of corporate dentistry and some public health care policies can dissuade us from spending time on important aspects such as health promotion and strict restorative protocols—especially regarding bonded materials. However, rewards can be drawn from the results of an artistic, natural-looking restoration. 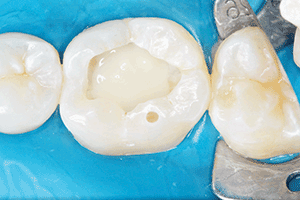 A meticulous bonding protocol, for example, can lead to reliable adhesive restorations, enabling preservation of the natural dental structure and mimicking nature. 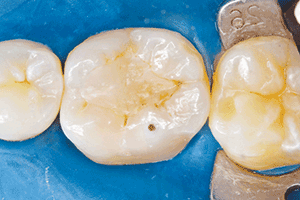 The popular nomenclature of a dental ‘filling’ is still very ingrained in our profession even nowadays, when highly developed materials allow us to restore dental structures almost back to their original condition. Therefore, the word restoration is more adequate when dental tissues are reconstructed with biomimetic materials. 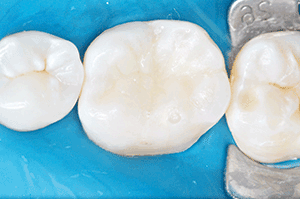 We all hope that resin restorative materials will evolve to a stage of no contraction. Until this happens, we need to stick with proven methods such as the incremental technique to overcome the drastic consequences of polymerisation shrinkage in the long-term prognosis of our restorations. 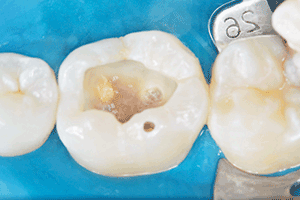 Bulk fill composites and glass ionomer materials can be used to speed up the protocol, but they should not serve as substitutes for a careful, incremental technique. 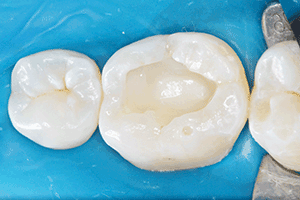 Restorative options could be indirect ceramics or direct composite resin. Indirect options result in destruction of sound tissue by occlusal reduction, mechanical preparation with geometric design, several laboratorial steps, cementation techniques and high costs. In contrast, direct techniques can provide a one-step procedure, involving simplicity of bond and restorative protocols. The main benefit of this philosophy is prevention of sound tissue. Neither ceramic or composite are better than sound dental tissue. The idea that wide MOD cavities cause dental cuspids to fracture and that covering these structures is the best protocol must be reconsidered. The authors selected a case to illustrate this philosophy. For more information, call 0845 602 5094 or visit 3mespe.co.uk. The patient presented with an infiltrated occlusal composite on the LL6, followed by recurrent decay (Fig. 1), as well as lack of correct morphology (Figs. ?2 and 3). 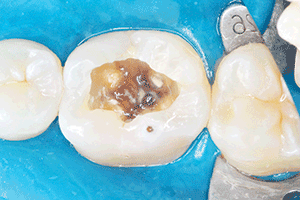 Soft dentine was removed, resulting in a deep and wide cavity with unsupported enamel (Figs. 4 and 5). The pulp-dentine complex was protected using a modified glass ionomer resin, 3M Oral Care’s Vitremer Core Buildup/Restorative (Fig. 6). 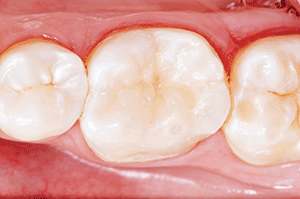 The chosen bonding technique was a selective etching of enamel with 35 percent phosphoric acid and a self-etching Scotchbond Universal bonding system from 3M on dentine. 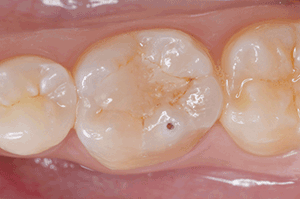 Filtek Supreme XTE Bulk Fill composite from 3M, shade A1E, was used firstly in a flowable consistency to re-enforce the unsupported enamel (Fig. 7), then in a restorative consistency to substitute the dentine in the pulpal wall of the occlusal cavity (Fig. 8). 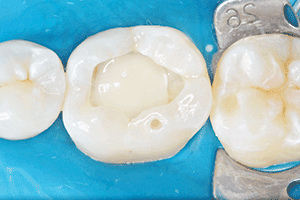 The final layers that act as a substitute for the enamel were restored with a nanohybrid composite, 3M’s Filtek Supreme XTE Universal Restorative in shade A1, using one increment for each cusp and allowing a correct sculpture of natural morphology (Figs. 9 and 10). With a final restoration that effectively mimics the natural tooth, chewing efficiency is increased and the loads supporting the tissues are more evenly distributed. Like artisans, we can employ our knowledge and skills to forge a unique piece of art in every patient, through provision of a long-lasting and beautiful restoration. 3M, Vitremer, Filtek and Scotchbond are trademarks of 3M Co.
Dr. Italo Moraes began practising dentistry in 2002. He is particularly interested in trying to understand his clients as individuals with a complex combination of characteristics. 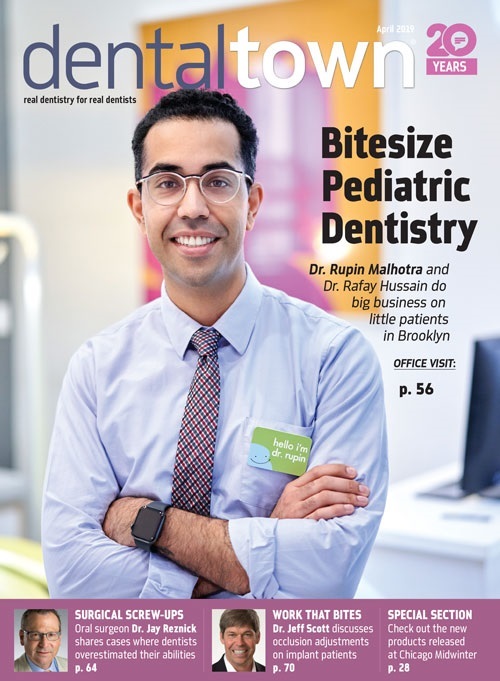 He works to promote good oral health and natural-looking smiles, ultimately aiming to improve his clients’ quality of life. Dr. Bruno Carlini has a special interest in oral surgery and aesthetic dentistry.